Nothing says royalty quite like being name after the King himself. Thus, I give you the King Charles Spaniel. Believed to have a lineage originating in Asia, the Charlie (as this breed is oft fondly called) became a popular gift amongst royalty during the 16th century. King Charles II was particularly fond of the breed and as such, is oft credited with the increase of popularity for the Spaniel throughout England. It is even said that he allowed the dogs to roam freely throughout the palace, no matter the occasion. King Charles love for the dog and his impact on its popularity throughout England is the very cause for the breeds endearing name. King Charles Spaniels are loving, loyal and intelligent dogs. Typically quiet and laid back, they can be a bit reserved around strangers if not allowed to socialize. They are good with other pets, including cats and larger dogs. The King Charles will also get along with most children. But very young and energetic children will often overwhelm them with their high level of excitement and noise. Low energy levels and low exercise requirements make them ideal for apartment living or as pets for the elderly. Cuddling up next to their owners or snuggling down in a soft pillow are their favorite places to be. If let alone for too long though, they can begin to suffer from separation anxiety and will cope by obnoxious barking and chewing on whatever is within their reach. People with extremely busy schedules might consider a different breed. Being an indoor dog they do not fair well in the heat or cold, and being outside too much can cause their silky coat to become rough and matted. Daily grooming can help to alleviate this issue and keep their fur in pristine condition, as well as reduce how much they shed. Typically, the King Charles Spaniel is no taller than 12 inches at most with an average weight ranging from 8 to 14 pounds. They tend to have a square body with a domed head with long ears. Their snout is very short with an up turned nose with some extra skin hanging under their eyes. The tails of the King Charles is often docked to about 2-4 inches, or found in its natural screw. Their coat is long and silky with feathering around their feet and tails. The coat sheds a moderate amount which is typical for longer haired breeds. Straight or wavy, the silk coat comes in four recognised colors. Ruby (a rich mahogany red with occasional white splashes). 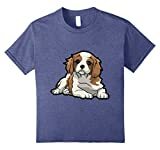 The King Charles Spaniel is NOT to be confused with the Cavalier King Charles Spaniel, however. While yes, the names of both dogs are nearly identical and while they do share the same lineage and many of the same traits, they are two entirely different breeds. As previously stated, the King Charles Spaniel has a very short muzzle with floppy ears and an upturned nose. The Cavalier King Charles Spaniel, on the other hand, has a longer snout with a more rounded, smooth nose. The silky smooth coats and the vast variety of colors are shared by both breeds. Cavalier King Charles Spaniels also tend to be larger, standing upwards of 12 to 14 inches with a weight of up to 18 pounds. Unlike the King Charles, the Cavalier most often does not have a docked tail. The Cavalier also has a flatter skull and higher ears than the King Charles. Both of these breeds share very similar temperaments as well. The Cavalier and King Charles are very loving, loyal and happy dogs. Both are fairly easy to train and are well suited for first time owners and families with children. The Cavalier is more energetic than upturnedKing Charles, but still only requires a daily walk to be satisfied. Another major difference comes with health issues. The Cavalier is prone to having a variety of health issues. Many of these issues can be avoided by diligently looking into the genealogy of the Cavalier, but even that doesn’t guarantee they will be free of major health issues. When looking for a new four legged family member, look no further than the King Charles Spaniel. Covered in a beautiful silky fur coat, this small dog is perfect for everyone, from the first time owner moving out on their own, to the elderly looking for companion to keep them company. Fond of attention, these intelligent dogs will love you unconditionally for their entire life, undoubtedly brightening yours. 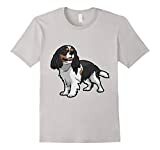 Named after royalty, the King Charles Spaniel will bring years of happiness to the lives of anyone that decides to bring one of these beautiful dogs home to join their family.